The domestic equity market, as measured by the S&P Composite 1500®, ended Q3 2018 with a gain of 10.47%. Over the past 10 years, the S&P Composite 1500 had annualized returns of 12.05%, showing an impressive bullish run since the 2008 Global Financial Crisis. Perhaps reflecting the market environment, growth-oriented investment styles, such as momentum and growth, have been the best-performing factors over the past 12 months. For example, the S&P 500® Momentum , S&P 500 Growth , and S&P 500 Pure Growth posted excess returns of 12.46%, 7.3%, and 3.14%, respectively, over the S&P 500 (17.91%). Empirical evidence shows that factors tend to earn higher risk-adjusted returns than the broad market over a long-term investment horizon; however, their returns can be rather cyclical in near- to mid-term horizons. Much like asset classes, depending on the market environment, some factors outperform and some underperform for extended periods. 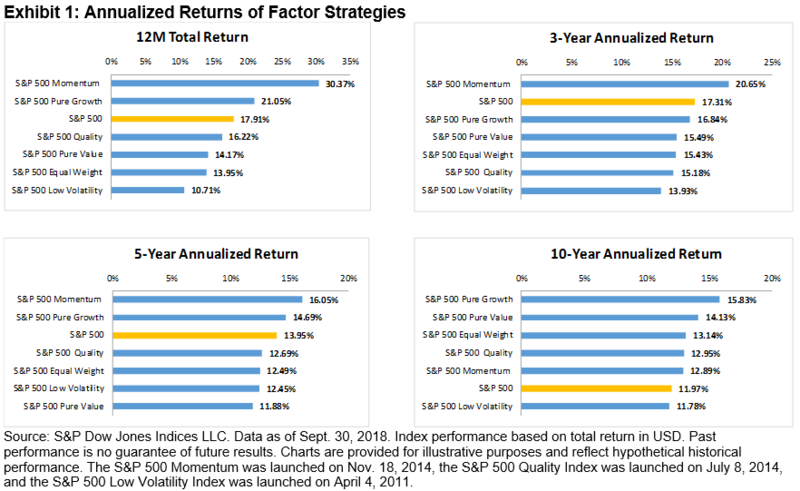 Using annualized 1-, 3-, 5-, and 10-year returns of various factor strategies, Exhibit 1 highlights the cyclical nature of factor returns. While factors returns are cyclical, it is still possible to establish a generalized pattern of returns through various market environments. 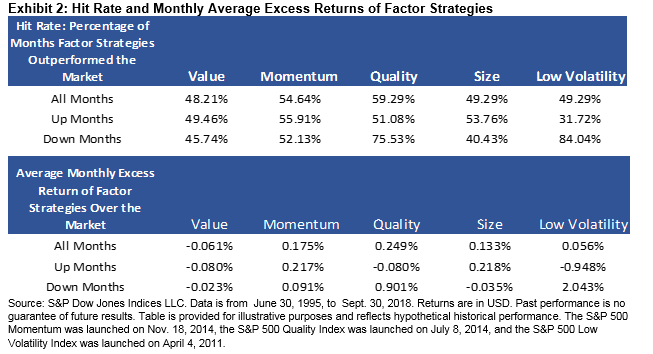 Using the monthly returns from June 30, 1995, through Sept. 30, 2018, we compared large-cap value, quality, momentum, low volatility, and size (represented by the S&P 500 Equal Weight Index) strategies against the S&P 500 (see Exhibit 2). We computed their hit rate (in percentage) in up, down, and all market periods. In addition, we calculated the average monthly excess returns of the factor strategies in those three periods. We can see that in general, the momentum and quality factors did better than the benchmark in all market periods. In up markets, the quality, momentum, and size factors had above average hit rates (> 50%). In declining markets, factors such as quality and low volatility stand out clearly, with hit rates above 75%. In other words, out of the 280 months that we studied, the S&P 500 had negative returns in 94 months. Of those months, the S&P 500 Low Volatility Index and the S&P 500 Quality Index outperformed over 75% of the time. In addition, average monthly excess return figures show the magnitude of out- and underperformance by factors in different market environments. In general, during up markets, excess monthly returns of factors such as low volatility, quality, and value tended to be negative. However, a different picture emerged when markets declined, with the low volatility and quality factors posting average monthly excess returns of 2.04% and 0.91%, respectively. Hence, factors such as quality and low volatility generally have defensive properties with asymmetric payoffs, especially for the latter. Therefore, one can group factors into two camps—return enhancing and risk reducing—with both offering higher risk-adjusted returns than the market over the long run. The momentum factor can potentially offer higher returns than the market in an upward-trending market. Conversely, low volatility and quality offer a higher degree of downside protection while providing limited upside participation. For more discussion on playing defense and offense with factors, tune into our webinar on Oct. 17, 2018. Please click here to register. We define up market as months in which the S&P 500 has positive returns. Similarly, we define down market as months in which the S&P 500 has negative returns.